Beagle photogravure from The Sportsman's Calendar published by The Berlin Photographic Company after Maud Alice Earl (English, 1864-1943). 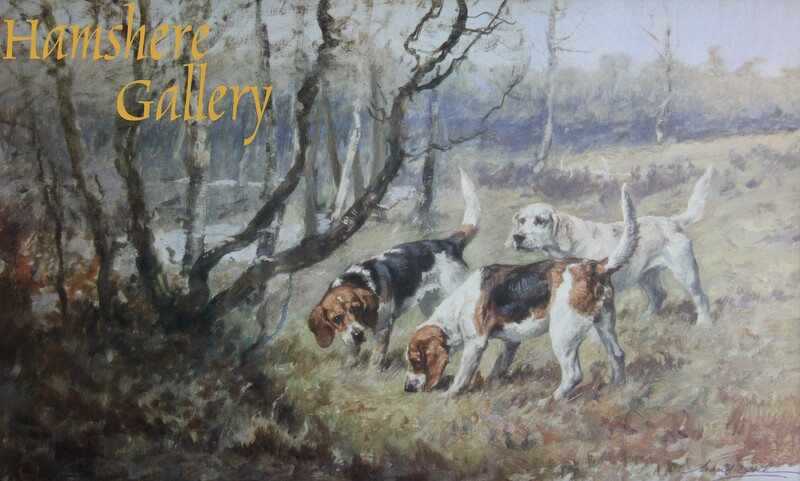 “January - "A Check .... Beagles" “ a photogravure of Beagles published 1906, as part of The Sportsman's Calendar by The Berlin Photographic Company after the painting by Maud Alice Earl (English, 1864-1943 The Sportsman's Calendar featured twelve of Maud Earl's works, January - "A Check .... Beagles"; February - "... Spaniel"; March - "Nipped in the Bud - Wire-Haired Terrier"; April - "Raw Material - Welsh Springer Puppies"; May - "Visiting The Coops - Ilchester Retriever"; June - "The Long Vacation - Foxhounds"; July - "Near The Holt - Otterhounds"; August - "The Twelfth ... Setter"; September - "Brace-Work ... Pointers"; October - "A Busy Team ... Cockers"; November - "Full Cry ... Foxhounds"; December - "Tender and True ... Retriever". English, 1906. The Sportsman's Calendar edition was limited to just 100 sets, each signed by Maud Earl, and came in a case designed so that a different that a different photogravure could be displayed for on month of the year.